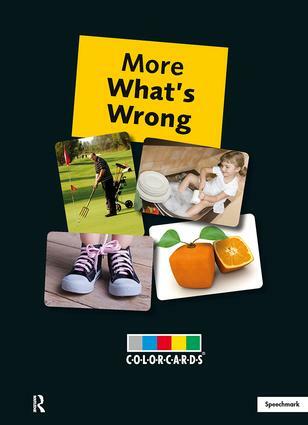 This set of 36 cards depicting a range of activities and situations incorrect, unusual or unexpected elements to identify and discuss. The open-ended nature of the problems posed enables differing levels of application, from single identification of the out of place or incorrect feature, to understanding and explaining the remedies, and potential consequences of the activities as they are shown. The types of situations depicted include: Mistakes with clothes; Wrong object; Wrong method; and Impossible and unlikely events. With scenes such as cutting grass with scissors or washing up whilst sat in the sink there are opportunities to have fun whilst developing the following lifeskills: Observation; Deduction; Insight; Problem solving; Anticipation; Story telling; Discussion; and Developing ideas. These versatile cards can be used with individuals, groups or in the classroom and the accompanying manual includes possible discussion start points and suggested ways to structure a session. Age: All ages Contents: 36 A5 cards; accompanying booklet, boxed ISBN: 978 1 90930 128 3 Product code: 001-5968. This set of 36 cards depicting a range of activities and situations incorrect, unusual or unexpected elements to identify and discuss. The open-ended nature of the problems posed enables differing levels of application, from single identification of the out of place or incorrect feature, to understanding and explaining the remedies, and potential consequences of the activities as they are shown. These versatile cards can be used with individuals, groups or in the classroom and the accompanying manual includes possible discussion start points and suggested ways to structure a session.